← Celebrating Groundhog Day in Miami? Just Got My Advance Copy of ‘Robot Law’! 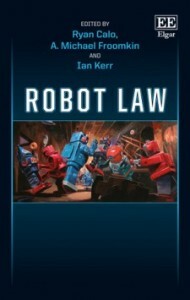 This is exciting: just got my first copy of “Robot Law,” a book I edited with Ryan Calo and Ian Kerr. I suppose I might be a little biased, but I think it’s a pretty darn good collection that will give anyone interested in how society will cope with robots plenty to think about. Robot Law is apparently going to list for $165 when it’s out in (very) late March, which is a lot, but you can pre-order it for less, or buy an online copy for much less. Meanwhile, however, you can peek inside, and read my introductory essay which gives you a tour of the wonderful contributions by our extraordinarily varied contributors. This is not a book just by some law profs: it’s an attempt to do real interdisciplinary work and, more importantly, to foster an ongoing series of interdisciplinary conversations. Of course, the real-life place where we do that is at We Robot — registration for this year’s conference is now open and the early-bird discounted registration ends Friday.